I continue working through the pile of recycled jeans I had collected. I am impressed with how much usable fabric there is in a pair of jeans and also how soft it is once all the seams and rivets are removed. It makes very comfy pillows and I have just finished #4 using the fourth technique. This time I made a design with machine appliqué. Here is my collection so far. It includes the graphic ampersand in machine appliqué, the pieced frayed-edge design, a bleached zig-zag and the original pieced chevron pillow. This collection is for the sofa in my living room which is eclectic in style but probably best described as contemporary country. 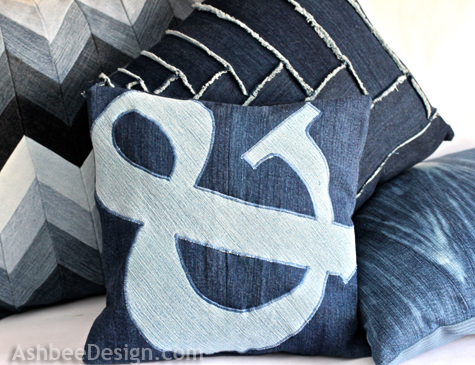 The denim used for these contemporary designed pillows is a perfect addition. My goal is five or six pillows, all different in technique but crafted from the same stack of old jeans. Four are done and I have no shortage of ideas. I am running out of old pillows to recover though. 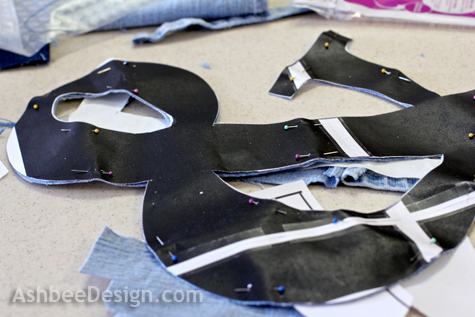 Machine appliqué was the easiest design so far. And, just like the other three designs, I will include a tutorial. Links to the other three design tutorials are at the end. I love the ampersand as a design element and even have a Pinterest board for just ampersands. 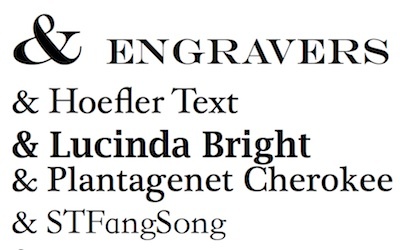 This design would be as effective with just about any number or letter as well. Create your pattern. I created mine using iDraw but any program that allows for large fonts and the ability to rotate them will work. Choose the character you would like to use and look through a variety of different fonts for that character in a style you like. You need to avoid anything with thin lines for this project. I made a list showing the ampersand and the title of the font. In the end I selected the Lucinda Bright Ampersand. I measured my pillow form and decided my design needed to be 13" square. 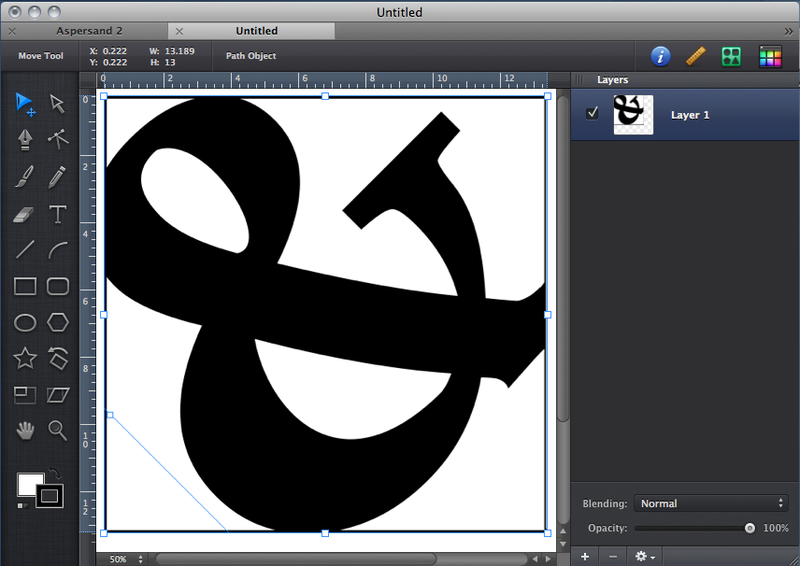 In iDraw I drew a 13" square and made a very large Ampersand (500pt). I rotated it within the square to make the design more dynamic. Notice I also made it larger than the square. which I then taped together to make my pattern. I also selected two pairs of jeans that were contrasting denim colors. I decided to place a light ampersand on a darker background although I debated the opposite as well. Either would work. 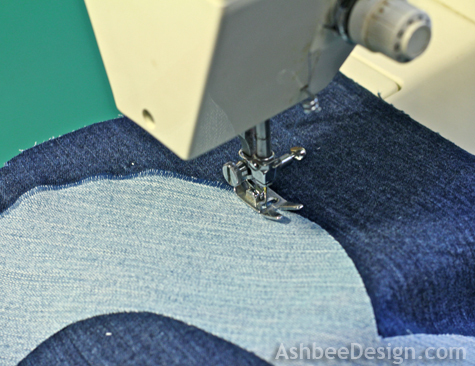 I cut the legs off the jeans and removed all seams and hems creating flat scraps to sew together for my pieced fabric. It took two leg backs for each color. I stitched the legs together making a square of dark denim and a square of light denim. 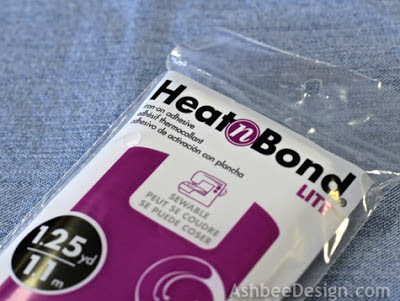 I used Heat n Bond iron-on adhesive to hold my two layers of fabric in place. It is very easy to use and helps a lot. 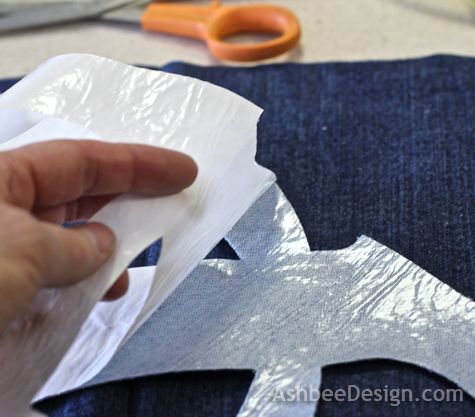 Following the directions on the package, I adhered the adhesive to the back side of the lighter denim square. I just used a iron on medium high heat and held it for 2 seconds in each area. It stiffened up the fabric and made it much easier for cutting. 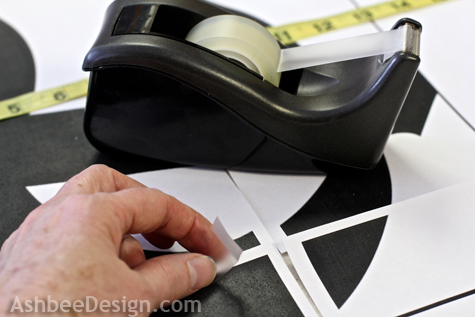 I pinned the paper pattern to the right side of the lighter fabric and carefully cut it out. I cut out the inner spaces as well. I removed the pins and the paper backing on the adhesive. 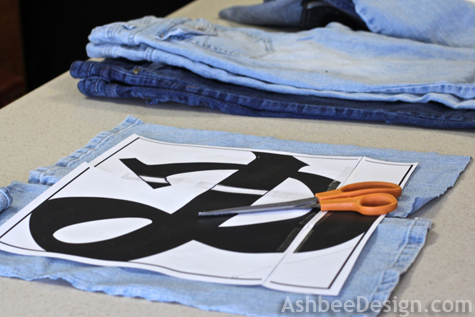 I then positioned the ampersand adhesive side down on the front of the dark denim square. I pinned it in place and again ironed it. The directions said to iron for 6 seconds but with the heavy jean fabric I found it took twice that amount of time. Using my sewing machine, I first did a sample on a little square to establish the correct settings. 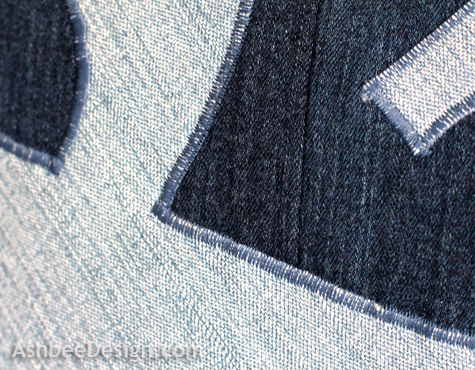 I used a wide zig-zag stitch and short stitch length combined to create a satin stitch. My sewing machine is a very basic model and fancier machines will have a setting for this. It helped to practice on a scrap because if the stitch was too small, it created a puckered edge which I didn't want. 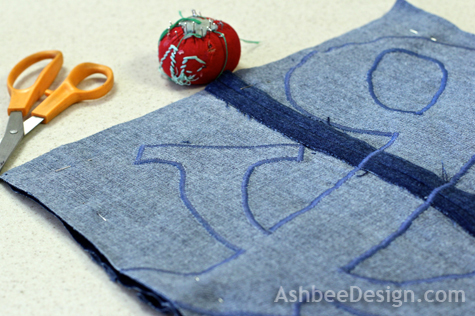 Sew all edges of the design using this tight, wide stitch being careful to make nice square corners. 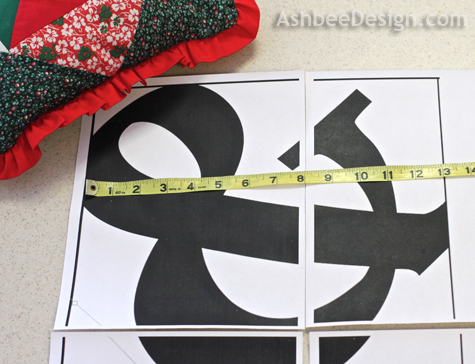 Once done, cut your fabric to exactly the size needed for your pillow cover plus 1 1/4" to allow for seams. Cut a backing fabric as well. My backing is split and hemmed in the middle to allow for a velco closure but you can make any type of pillow closing you want. I like to be able to remove my covers to wash them. 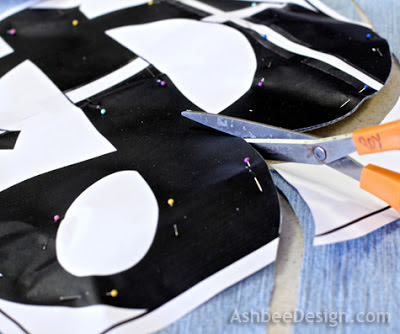 Pin the two layers together with fronts facing. Stitch the front to the back leaving a space to insert your pillow form. Clip all corners and then turn the pillow right side out. Close using the techique you decide to use. You have another denim pillow! As mentioned earlier, I now have four! Here are links to the other 3 tutorials. Be sure to check our my Denim Themes page as well. It is filled with hundreds of ideas for using denim in décor. And here is a link to my Pinterest Board on Denim and Indigo. It continues to grow. Do you have any links to interesting things you have done with denim? This is SO cute! I'm terrified of my sewing machine (lol), but I might just have to bust it out to attempt this. I found you at The Shabby Creek Cottage--thanks for sharing!! Having sewing skills is very helpful for DIY. I used to sew all my clothes in high school but rarely sew now. It helps having that basic knowledge. Thanks for visiting and commenting. I totally agree! My mother-in-law is an amazing seamstress, and she has been giving me lessons, so I'm slowly learning! Just wanted to let you know that I loved this project so much I featured it in my "Weekly Favs" here: http://justagirlandherblog.com/reader-love-and-my-weekly-favs/ !! Thanks so much for sharing your beautiful pillow!! The collection keeps growing and really adds a nice touch to my old and faded sofa. Thanks for stopping by. How wonderful, love them all. They look real cosy. The coziness was the surprise factor. 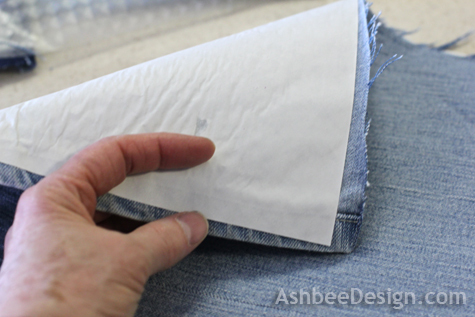 The washed, recycled denim fabric is very soft and makes great pillow material. Thanks for taking the time to comment. What a great idea. I can imagine a nautical pillow would love nice with the denim, too! Thanks for the ideas! I agree. Nautical theme, beach theme, country theme are all naturals for denim. Thanks for commenting. The pillows are great....I am IN LOVE with the chevron pillow! Looks awesome, and so very clever. Thanks for the great tutorial! Tutorials are my speciality. You can tell I used to be a teacher! I lve putting together a good one. I have collected most of them and have them under the Tutorials link in the header. Check them all out. And send pictures of your finished projects! Dropping by from Jennifer's party. I love the Ampersand pillow so cute! LOVE IT! i found you on the Thrify Groove I can't lie...my sewing machine hasn't been out in years but there is never a time like the present and i have TONS of old jeans! I can't wait to try this! I am hosting a blog party on my site today and monday and both links are up so if you get a chance...stop by in and link up! Send pictures if you do. There are so many possibilities and I'd love to see some other ideas. Thanks for visiting and commenting. 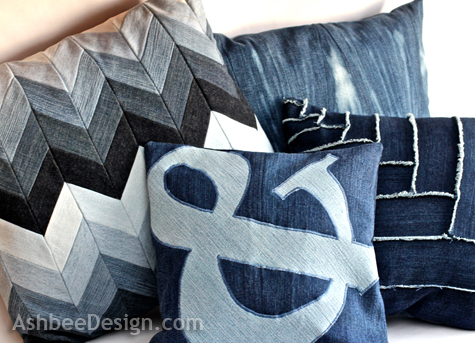 Love these old jeans turned pillows.. You have such great ideas! Many of my ideas are inspired by things I see online especially Pinterest. Ideas are never new but based on an inspiration and then expanded. Thanks for visiting. Have a great weekend. 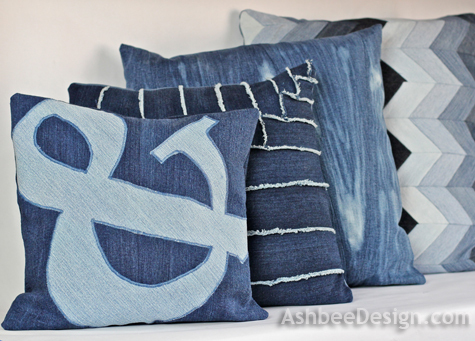 I am so loving all your different designs on these denim pillows! All of this are wondeful! Thanks Diann. Each is different but the collection of them on my couch makes me very happy! It is the variations connected by the same materials that makes it work. Thanks for visiting and commenting. Nice to meet you Helen and thanks for visiting. Spend some time looking through my Denim Theme overview for a huge selection of denim ideas. Click on themes in my top navigation bar. I love it. I'm not great with sewing but I would definitely buy one. They are cute! Nice job! Haven't started selling my creations yet but the house is filling up! Might need to some day. Thanks for visiting. Gorgeous denim pillows! 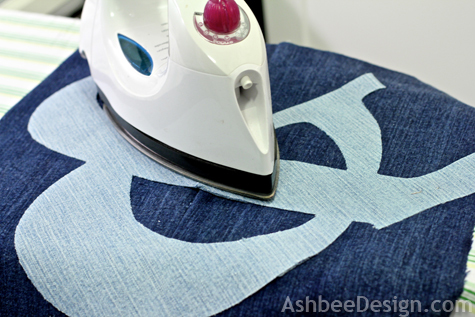 I love finding cute pillows and ways to reuse denim! I'm pinning!!! I still have more denim so am hunting for idea #5. I just love the fabric for crafting. Thanks for visiting and commenting. Featured!!! Yippee. And thanks. It is amazing how much better things look when shared in a big photo and not the tiny photos of link parties. I appreciate it whenever one of my designs is featured and love looking at the other features. Leads me to new blogs, new ideas, etc. Christine, Thanks for the feature and I will be at your party to share more. Taking a break from the pillows because that's where the creativity is flowing. I expect to making more though. Your denim pillows are the most handsome, attractive use of jeans I've seen to date. Mostly, I find things made from jeans to be so unappealing, but you've hit the mark with all of these. I, too, have quite a stack of jeans to use. I think I may have to try some of your pillow ideas here, if you don't mind! Well done!! 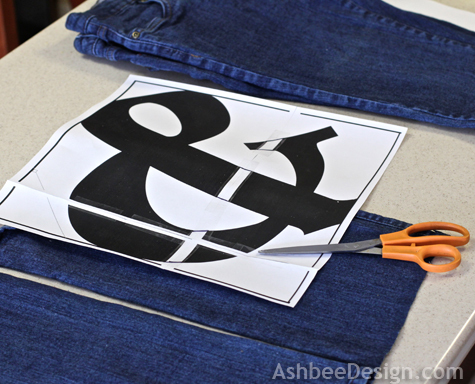 Could you trace your ampersand in reverse on your fusible paper, then fuse it to the back of your fabric? No pinning needed then.